Join Us!!! We are looking for someone to help us cover Kenyan basketball. Please send us an e-mail. Man-of- the match shooting guard Victor Bosire scored a game-high 27 points as champions Kenya Ports Authority rallied from behind to rock Ulinzi Warriors 77-74 in an entertaining Kenya Basketball Federation men's Premier League play-offs finals Game One at Nyayo National Stadium gymnasium on Saturday. Bosire, who played a destroyer role, unlocked a 74-74 deadlock with two free-throws as KPA, who trailed in the entire game till then, snatched their first lead at 75-74 with 28 seconds to go and never looked back. Strong Victor Ochieng scored 17 points for the winners, while William Ochieng (200-F-85) replied with 17 for Ulinzi Warriors. Game Two of the best-of-five series is scheduled for Sunday at the same venue from 4pm. KPA coach Sammy Kiki said: " I told Bosire at half-time that he was the only player who could save the team from defeat. 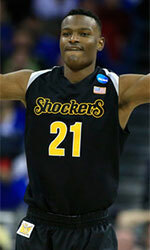 We agreed as a team that we make use of him in the last two quarters and it worked for us." Ulinzi Warriors coach William Balozi said: "We started well but our defence leaked in last quarter. We still have a chance to correct the mistakes in Game Two to came back into contention." Ulinzi Warriors are out to extend their good run in the Kenya Basketball Federation men's Premier League title when they play underdogs World Hope at United States International University of Africa (USIU-A) grounds in Ruaraka from 4.30pm on Saturday. Last year's losing finalists Ulinzi Warriors start as favourites to win against the struggling World Hope. The soldiers won four straight first leg matches before crashing 68-55 to Thunder last weekend but the team, coached by William Balozi , recovered to defeat USIU-A Tigers 55-50 in a subsequent match, proving that they are top contenders to reclaim the league title they last won three years ago. World Hope were humiliated 51-48 by Kenya College of Accountancy-University but they rediscovered their winning ways to upset Umoja 67-56 last weekend. Ulinzi Warriors will rely heavily on newly-recruited shooting guard Victor Bosire, Joseph Khaemba (180-PG-91), forward James Mwangi and veteran John Washika as they seek two crucial first leg points. Ulinzi team manager Stephen Bartilol said: 'It was a bad day for us to lose unbeaten record and after working on our weak areas. We missed the services of forward Alvin Nyangweso, who is now back to boost the team attack." Ulinzi will travel to Mombasa to meet champions KPA next weekend. In its remaining first leg fixtures, Ulinzi will play Eldonets, Lakeside and Emyba before the first leg ends on May 5. Ulinzi Warriors' unbeaten run in the Kenya Basketball Federation men's Premier League comes under threat on Saturday when they lock horns with Thunder at United States International University Africa at 4.30pm. The season enters the fourth week, with 24 first-leg matches on the cards at the same venue on Saturday and Sunday. Double courts and 'A' and 'B' will be used to accommodate congested fixtures with the opening two matches starting at 9am and the last from 4.30pm. Ulinzi Warriors beat Umoja 78-63 last weekend for a fourth straight win and lead the 12-team table on eight points. Ulinzi, coached by William Balozi , have so far registered victories against Equity Bank, KCA-U, Strathmore University Blades and Umoja. The Eastleigh-based soldiers, who will wind up their two-match programme against hosts USIU-A Tigers on Sunday, got a big boost by signing shooting guard Victor Bosire, and forward Joseph Mwangi from reigning champions Kenya Ports Authority, and towering forward Alvin Nyangweso, formerly of USIU-A Tigers. Team manager Stephen Bartilol said: "We have trained together for a week and nothing will stop us from keeping our clean run going. We respect Thunder, whom we eliminated 3-2 in the play-off semi-final last season after recovering from two games down." He said the return of seasonal Tiberius Menya and Byron Mabonga from official duties have also beefed up their squad as they bid to reclaim the title they last won in 2015. Thunder on the other hand cannot be underrated because of their ability to turn up in big matches. Thunder will be fielding experienced former Ulinzi Warriors dangerous forward Ancette Wafula, veteran shooting guard Griffins Ligare and power forward Kevin Chogo. Thunder shocked champions KPA 88-76 at their backyard in Mombasa in the second week of the season to sound a warning to their opponents. On Sunday, Thunder, who finished third after defeating Strathmore University Blades 61-58 in the classification match last year, will start as favourites when they entertain World Hope. World Hope registered a morale-boosting 58-55 win over USIU-A Tigers in their last assignment and are scheduled to play their weekend opener against KCA-U on Saturday. Blazers will meet coach Waringo Gitau's Pirates while Strathmore University to face fellow students Raira University at 10.30am. Equity Bank will heavily rely on Feisal Aden as they confront newly promoted Emyba in another men's Premier League showdown. Emyba, spearheaded by Thomas Kioko, edged out rivals Eldonets 73-71, who defeated them 3-0 in last year's men's Division One play-offs final, last weekend. In Saturday's women's Premier League matches, reigning champions Equity Bank take on underdogs Kenyatta University Oryx at 12pm. Storms will play two tough outings against Strathmore University on Saturday before they meet unpredictable Zetech University on Sunday. Storms grabbed the third position last year following their 53-41 victory over Strathmore University Swords in their classification play-offs encounter. Newly promoted coach Juma Kent's University of Nairobi Dynamites, who made a comeback in the top flight competition after 22 years, will meet Tangit Sparks formerly Masaku Sparks on Sunday at 9am. Sunday's lower tier highlight will pit Little Prince against 4 Christ while Trailblazers tackle Blazers. Kenya Airports Authority will lock horns with Terrorists while Zetech University have a date with Kenya Defence Forces Morans. 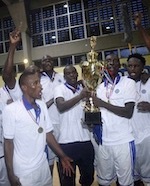 Kenya Ports Authority swept aside bitter rivals Ulinzi Warriors 3-0 with a 75-59 Game three victory to retain the Kenya Basketball Federation men's Premier League crown at the KPA hall Makande on Saturday. This happened as their women counterparts saw off Storms 75-57 in game three in Mombasa for 3-0 result in the semi finals to book a final date with Equity Bank, who dismissed Strathmore Swords 3-0 in the other semi final. In Saturday's tension charged eventful Game three, which was marred with several stoppages, KPA's Victor Bosire top scored with 19 points as they led 16-15 in the first quarter and 19-17 in the second for a 35-31 halftime lead. The dockers stepped up the pedal for a 18-16 third quarter score line keeping the game beyond the reach of the fighting soldiers. "I want to thank the boys for the hard work, determination and team work, which has seen us win the title three years in a row", KPA team manager Chris Ogutu said after the match. Ulinzi coach William Balozi was not happy with the officiating, but conceded defeat saying they will live to fight another day. In this game, Ulinzi's James Washika scored game high 20 points, while Erick Mutoro, who had a bad day in office, scored 13.